"Leaves of 3, let them be." This rhyme works for identifying both poison ivy (Rhus radicans) and poison oak (Rhus diversilobum). However, the rhyme does not work for the poison sumac shrub (Rhus vernix), but this can be identified with other methods. If you find any of these plants on your property or elsewhere and want to get rid of them, it helps to understand what makes them "poisonous" and how to deal with them safely. The Rhus genus is native to North America. In the U.S., poison ivy grows everywhere but on the West Coast, while poison oak grows primarily on the West Coast. Poison sumac grows in damp and swampy wooded areas in the southeastern U.S. and in some areas of the Northeast. In plant taxonomy, all three are sometimes classified as Toxicodendron rather than Rhus ("Toxicodendron" is from the Greek and literally means "poison tree"). Poison ivy (Rhus radicans) is the most widespread and most common. The trademark grouping of three leaflets on Rhus radicans has a reddish tinge when the leaves first come out in the spring, but the leaves turn green in the summer. Although the color (white) of its berries is often mentioned as a method for poison ivy identification, it is not as reliable as is identification by leaf. The berries, after all, are produced only at the end of the growing season. Knowing about the berries would do you little good when attempting identification in the spring, for example. Poison oak and poison sumac also have white berries. Poison ivy often grows as a vine that climbs vertically or extends horizontally through grass, and this is most common in the eastern U.S. In other areas, such as the Upper Midwest (and Great Lakes), it commonly grows as a shrub. True to the "leaves of three" rhyme, poison ivy typically has three, spoon-shaped leaves but can have more than three. The leaves can be an orangey-red on very young spring plants. Leaves on mature plants are green in the summer and change to yellow, orange, and/or red in the fall. Poison oak leaves often resemble the leaves of oak trees, but they can actually mimic the characteristics of neighboring plants and can adopt serrated edges or a round shape. They are typically grouped in threes but can be in groups of up to seven. The plants grow as both vines and shrubs. The leaves are green in summer and change to a bright orangey-red in fall. Poison sumac has at least seven leaves on each stem but can have up to 13 leaves per stem. The stems are characteristically red. The leaves are green in summer and range from yellow to orange to red in fall. Poison sumac has berries that grow in small clusters on individual stems. 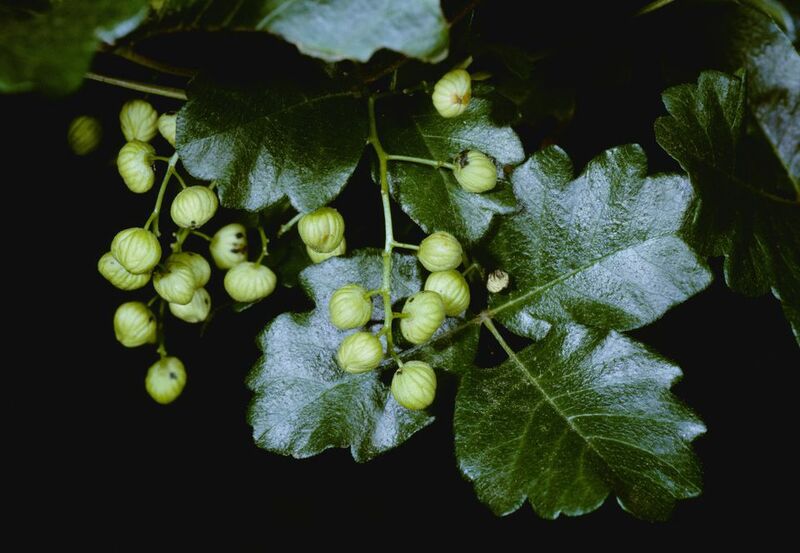 The berries are green in summer and change to white in fall. Poison sumac can grow as a shrub or a small tree. So what makes poison ivy (and poison oak and poison sumac) poisonous? The answer is urushiol, which is the sap that runs through all parts of the plant. Grazing against poison ivy with any exposed part of your body is all that it takes to release this poison. Complicating matters further, contact with poison ivy does not even have to be direct for you to contract the rash. For instance, if your dog runs through some poison ivy, then you stroke your dog's fur with your hand, you could come into contact with the sap and develop a rash. Likewise, if someone else had been working in a poison ivy-infested area with gloves, then you came along and touched those contaminated gloves, you could get the rash. So if the poison is spread that easily, poison ivy must be contagious, right? Wrong. It's only the urushiol that puts you at risk. Scratching your bumps doesn't cause the poison ivy to spread to other areas of your body. Nor will you contract the rash just by touching somebody else's rash bumps. Once the bumps are present, the damage that the urushiol can inflict has already been inflicted. Treatments for poison ivy rash also apply to symptoms from contact poison oak and poison sumac. Cures or treatments for this rash generally focus on reliving the skin irritation and itching. Different people find different degrees of relief by treating poison ivy rash with over-the-counter remedies, such as hydrocortisone. And despite its inclusion in the classic rock song, "Poison Ivy," even Calamine lotion has its limitations as a treatment. Some people have such a severe reaction to poison ivy that they need to visit a physician and get a shot. It usually takes about two weeks to get rid of poison ivy rash. For a home remedy, try applying the crushed leaves of jewelweed (Impatiens capensis). Jewelweed is a common weed in damp areas, and this "treatment" may very well be growing right in your own backyard. If you realize you've just come into contact with poison ivy, you can apply rubbing alcohol to the infected area, then rinse thoroughly with water. This helps to remove the urushiol before it has time to take effect. For the same reason, wash all of the clothing you were wearing when you contacted the plants, using the warmest water recommended for the garments. The same methods of eradication work on both poison ivy and poison oak. Unless you have swampland on your property, it is very unlikely you will encounter poison sumac in your yard. The first question to ask is how to remove poison ivy safely. When approaching the itchy weed to engage it in battle, try to have as little of your skin exposed as possible, since it is through physical contact with poison ivy (all parts of it, including the roots) that the rash is contracted. At the very least, this means wearing gloves, long-sleeved shirt, and full-length pants. Secondly, understand that removal methods may have to be done more than once to achieve complete success. One organic method used to get rid of poison ivy is to pull it out by the roots. The roots must be disposed of; do not burn them! Inhaling fumes from burning poison ivy causes far greater health problems than just the rash caused by skin contact. Another natural removal method is smothering. Smothering entails cutting the plants back close to the ground, then placing newspapers, cardboard, old carpeting, tarps, mulch, or some other covering on top. However, be aware that, even after you kill poison ivy plants, they remain toxic. So be careful in disposing of the roots of the dead vines after pulling back the smothering agent (even if you've waited for years). Use a pressurized tank sprayer, and mix the herbicide with water, according to directions. Spray the plants when they are fully leafed out. Choose a day with little or no wind for spraying. Also, check your forecast: Don't spray if rain is predicted at any time within the next 24 hours. Apply a heavy spray to plants growing on the ground or on a wall. For poison ivy climbing up a tree, you may wish to "paint" the herbicide on, so as to avoid damaging the tree with a stray mist from your sprayer.